To start creating more insight-driven content, search data can offer a gold mine of insights. Below we offer six SEO insights you can use to drive your strategy and results. #1 – Nail down your audience’s search intent. It’s no secret that keyword data can tell you a lot about what your audience is on the hunt for. But it’s the intent behind those search terms that really matters. Intent is what will enable you to create more valuable, “best answer” content for your audience. You can also use search intent to identify new content opportunities or gaps. When researching potential keywords in Google Keyword Planner or SEMrush, do your own recon and search the term in an incognito browser window. What content is ranking at the top for each query? What questions is it answering? What is so compelling about that page? (i.e. structure, video or other visual assets, etc.) Is there anything missing? Once you’ve analyzed what has made that page successful and helpful, you can apply those same tactics to your own content. #2 – Take advantage of older, high-performing content. Both SEO and content are in it for the long haul. Your content needs to be long-living to maximize its SEO value and drive significant organic results. Plus, with frequent algorithm changes to search engines, what might have been a poor performer in the past could be your top piece of content in the future. Because of this, your existing content actually holds a lot of potential. Are there any posts that have multiple page one rankings? What is each page ranking for? Which posts have the highest organic CTR or number of impressions? #3 – Low volume doesn’t mean low value. A common practice for marketers is to look to search volume data to determine target keywords and new content opportunities. Because search volume indicates the number of people searching for any given topic or question, it’s tempting for marketers to go after those searches with a high volume. Who wouldn’t want to capture all 500 monthly searches, right? While it’s tempting to go after high-volume search terms, it’s not always the best choice. And with the rise of voice search, search queries are getting longer and longer. When reviewing potential keyword targets, pay special attention to the long-tail variations of your short-tail topical areas to find the real questions people are asking (tools like answerthepublic.com are perfect for revealing this). Of the long-tail variations you identify, which ones have the least amount of competition? Is the estimated Cost Per Click high or low? This practice can help you find a niche, relevant keyword with a low competitive score that could be a quick, easy page one ranking that you didn’t have before. Still want to go after those high-volume, competitive terms? We’ll walk you through how to rank for competitive keywords. #4 – Review inbound links to find top performers. Linking is an important component to any SEO strategy as it helps indicate to search engines that you are an authoritative and credible source of information. The better sites you have linking to your content, the better chance they have to rank higher in the SERPs. But what insights can it provide? In looking at the number of sources linking to your content, you can see which topics others find the most helpful, giving you a framework you should try to replicate in future content. In addition, you can create supporting blog posts that further promote or amplify your most linked to content. 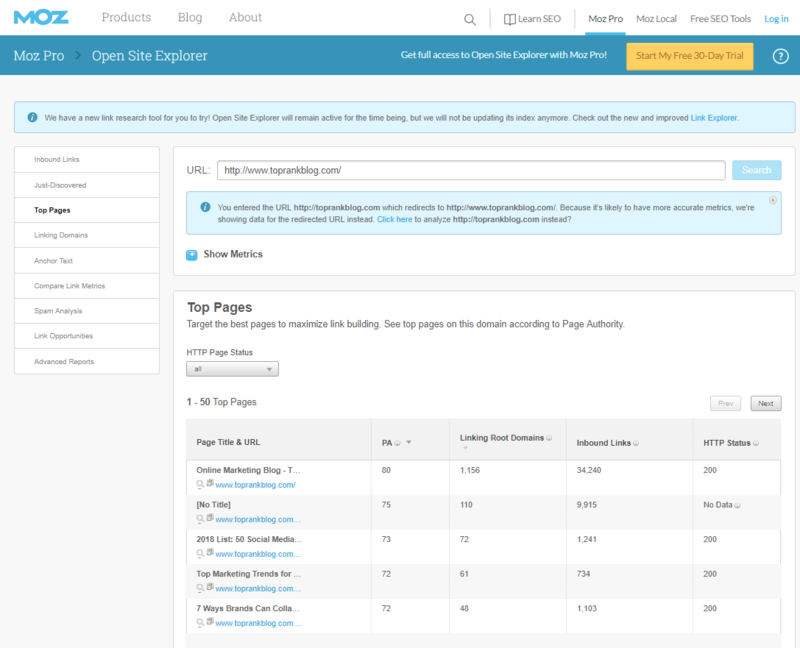 To see your inbound link data and check the credibility of the sites they originate from, try using Moz’s Open Site Explorer. If you want to quickly find your most linked to pages, use the Top Pages view of the tool as shown below. #5 – Track the behavior of your search traffic. Once someone finds you through search, what do they do next? Do they bounce? Do they complete a form-fill? In mapping the next steps your audience takes for each keyword group, you can better understand where they are in the funnel and customize additional content that helps move them from stage to stage. Through CRO and A/B testing tools like Google Optimize or Optimizely, you can make small changes to your existing content (e.g. CTA placement, content length, etc.) and see what resulted in more conversions — micro or macro, depending on what stage of the funnel your content is aimed at. As for what this means for your content strategy, you should look for what specific changes moved the needle or caused a dip in performance. Armed with the results, you can take what worked well and apply it to both your past and future content. #6 – Uncover new content opportunities with in-site search. If someone isn’t finding what they need on your site, they probably tried searching for it. This could mean you have a ripe content opportunity resting right under your nose. Make sure to regularly pull data from your own site’s internal search bar — you just may find a new keyword or topic you haven’t covered yet. If you’re uncovering a lot of potential opportunities with this method, prioritize them using the number of times someone used that search term. Not sure where to find that information? Log into Google Analytics and click on the Site Search report listed under Behavior. Here you can view data on the search terms used, how often they’re used, and a host of other data points. Using data from our own Site Search report (see below), it looks like a blog template might be a good idea for a future post or downloadable asset. Believe it or not, data shouldn’t drive your content strategy. Data is open to interpretation, which is why marketers need to be data-informed, not data-driven. Digging into why something failed or took off is more important than tossing out a failed tactic or doubling down on a successful one. Without this analysis and insight, you could be making rash decisions that don’t produce the results you’re looking for. 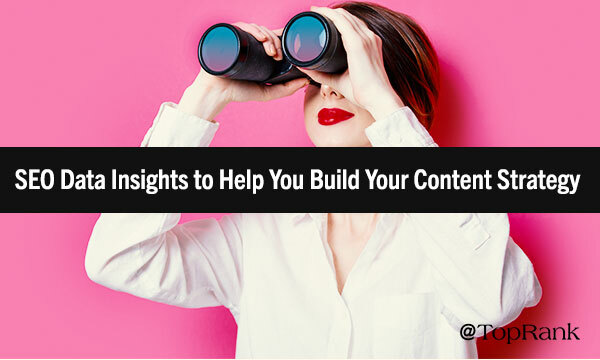 Instead, content marketers need to use insights to inform their strategy, not create it. For more insight on how to use data to your advantage, check out these data-informed content marketing tips.